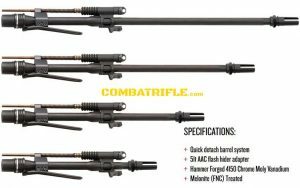 Brownells has just begun offering several Bushmaster ACR Barrel Kits for sale in the .5.56 caliber and four barrel lengths. Giving the Bushmaster ACR platform the versatility that has been desired since its development, these factory Bushmaster ACR barrels in a variety of lengths ensure you have the length you need for the situation you find yourself in. Available in 18.5”, 16.5”, 14.5”, & 10.5” lengths these ACR barrels are set up with the quick detach barrel system that allows for a fast, simple and convenient barrel change. All Bushmaster ACR barrels are hammer forged from 4150 chrome moly vanadium, and are Melonite treated for durability. 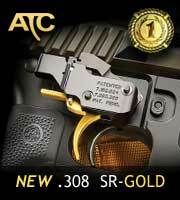 Each ACR barrel comes with an AAC 51T flash hider adapter, compatible with corresponding AAC silencers. All NFA rules apply. Pull Charging Handle and lock to the rear. Remove Hand Guard by pushing the Hand Guard Retaining Pin through as far as it will go and slide the Hand Guard forward. Lower the Barrel Locking Lever and depress the Barrel Plunger. With the Barrel Plunger depressed, turn the Barrel Locking Lever counter-clockwise until it stops. Pull the Barrel Assembly forward until it releases from the Trunnion.